Philadelphia Flyers center Nolan Patrick and Pittsburgh Penguins defenseman Olli Maatta during the second period of a game earlier this season at the Wells Fargo Center. The smooth, round babyface implies a razor hasn’t yet touched his chin. He’s too young to buy a beer after a hard day at work – or even enter a bar – and he's still way too young to carry an NHL team. But there he was Wednesday night, seemingly the only one trying, the only one effective against the powerful two-time defending Stanley Cup champion Pittsburgh Penguins. 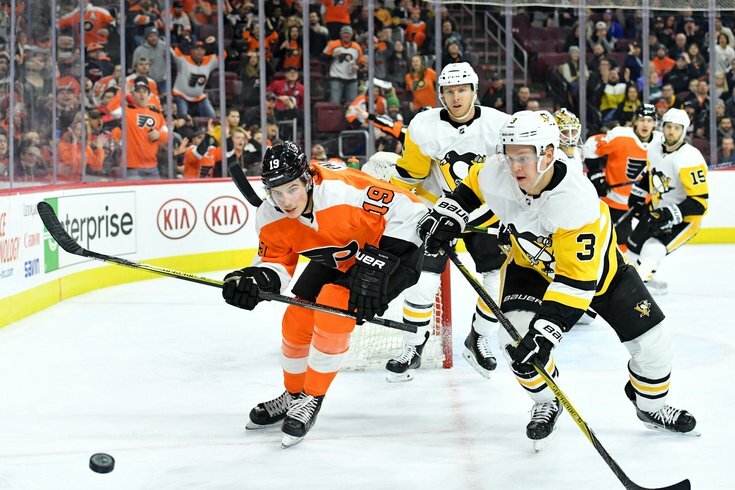 It was a little too much for rookie Nolan Patrick’s still-narrow shoulders to bear, but he was the lone bright point for the Flyers in their horrid 5-0 loss to the Penguins in Game 4 of their opening-round series at the Wells Fargo Center. Now holding a commanding 3-1 series lead, it seems all but a certainty that the Penguins will wrap up this best-of-seven series in five games – and put an end to the Flyers' roller coaster ride of a season – when the teams meet Friday night in Pittsburgh. In the meantime, the one positive in what was an otherwise disappointing effort by the Flyers was the 6-foot-2, 200-pound 19-year-old rookie who was forced to play first-team center in place of an injured Sean Couturier, who missed the game after suffering a lower-body injury during practice on Tuesday when he collided with teammate Radko Gudas. Paired on the first line with captain Claude Giroux, who despite having an MVP-caliber season has been a major disappointment throughout the series and was a minus-3 in Game 4, and Jake Voracek, who finished second on the team with 85 points in the regular season, Patrick was the Flyers’ best scoring threat. 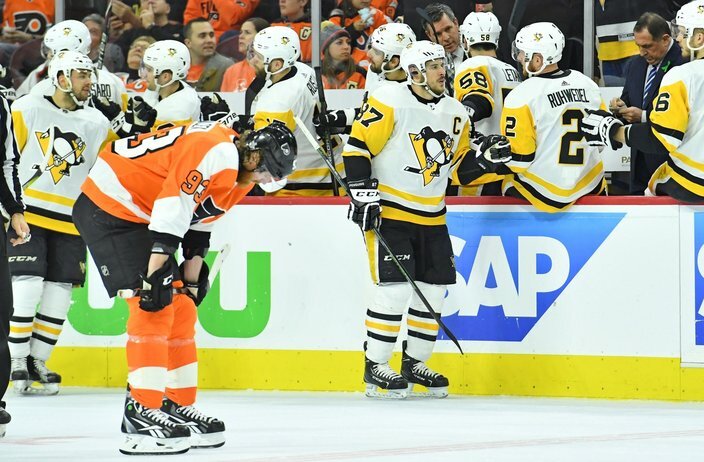 And although he didn't score, he created problems down low; he drove to the net, when most of the Flyers seemed reluctant to move at all; and he played defense, while his teammates stood still (see Kris Letang’s second-period goal). Once again, however, that wasn't enough. Throughout the series, the Flyers have been thoroughly outmatched, and outplayed. Dave Hakstol's been thoroughly outcoached, and out-schemed. As a result, Pittsburgh has outscored the Flyers 18-6 in their four games, including two shutouts. This is also just the third series in NHL playoff history in which the first four games have each been decided by four or more goals. Unfortunately, the Flyers have been on the wrong end three out of four times. “The second period was a real key part of this hockey game,” Hakstol said following his team's 5-0 loss on Wednesday. “From the start of the period, they pushed the momentum the first three, four minutes. We had an opportunity to turn the momentum with our first power play, and we didn’t do it. Goalie Brian Elliott didn’t look great, perhaps still returning to form after core-muscle surgery – but he didn’t get much help, either. Still, Hakstol didn't waste any time pulling his starter after Letang's goal, the third allowed by Elliott on 17 shots. Back-up goalie Michal Neuvirth didn’t fair much better, giving up two goals on just 13 shots. Penguins captain Sidney Crosby celebrates his second-period goal as Flyers forward Jakub Voracek skates back to the bench. Sidney Crosby – love him, hate him, curse him, it doesn’t matter – once again proved why he’s the best player in the world, scoring his fifth goal in four games and putting the proverbial nail in the Flyers' coffin with 9:04 left in the second period. There were four Flyers around him, and no one did anything. Neuvirth was so baffled that he was looking right, while Crosby was on his left. That just about sums up the Flyers’ night. Well, that and a few sticks being slammed out of frustration. And as the Flyers walked off the ice for what will likely be the last time at home this season, they did so with their heads collectively down and the sound of boos still raining down from the few fans still remaining.